I was born in Montevideo, Uruguay. I’ve been living in Barcelona since 1982, where I studied architecture at the Ecola Superior d’Arquitectura de Barcelona. 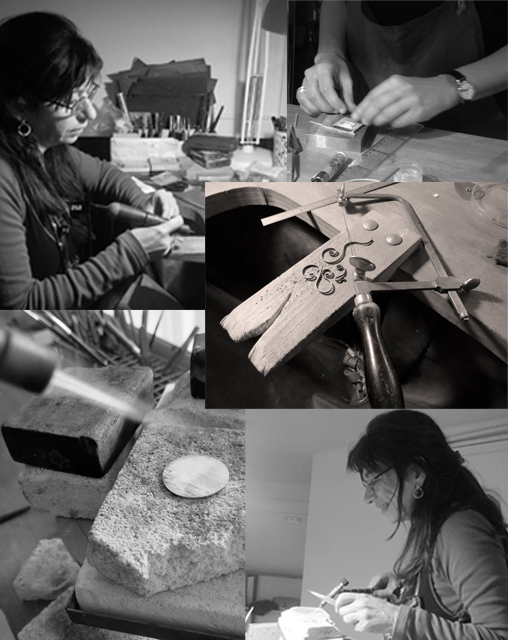 From 2005 to 2008 I studied at the School of Contemporary Jewelry at Jaime Diaz’ Workshop. From 2008 to today, I’ve been combining my work as an architect with creating my own jewelry pieces. In my workshop I enjoy experimenting with different techniques and materials , my collections and unique pieces are born from that translation of ideas. My goal is for my pieces to show that inspiration is everywhere, the idea that we belong to one place and many different places at the same time as long as you’re open to other cultures, if you know where to look. My job allows me to combine artistic creation and the joy of creating with my own hands.